Native to Asia and Vietnam. Introduced and escaped cultivation. Now naturalized in North America. Rare in Minnesota. Established in extreme southeastern counties, adventive elsewhere. Moist. Bottomland prairies, bottomland forest edges, banks of streams and rivers, roadside ditches, disturbed areas. Full sun. Rich soil. This is a annual vine that rises from a long taproot. 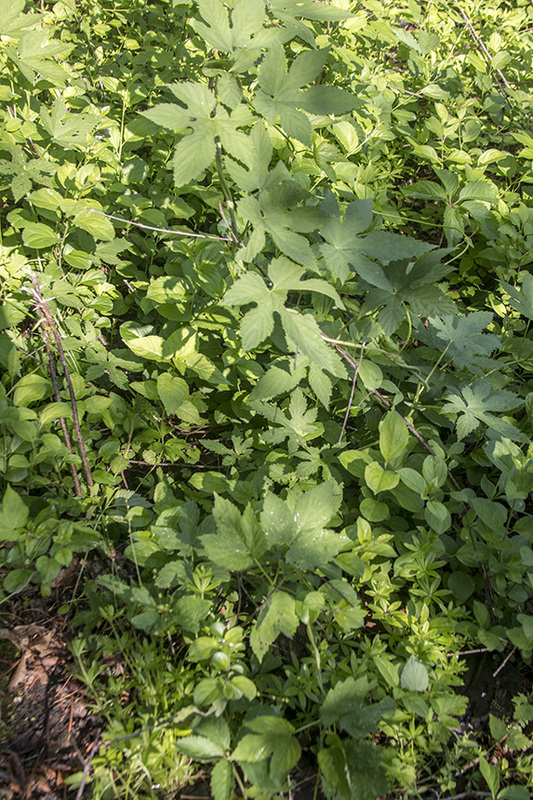 It can form dense mats several feet deep covering all other vegetation. The stem is stout, non-woody, light green, and branched. It is solid at maturity and usually finely ridged or angled. It is rough and prickly to the touch, and is densely covered with stiff, 2-branched hairs on the ridges. Each hair has two rigid branches that spread in opposite directions. These hairs facilitate climbing by anchoring the vine to adjacent plants or structures. The stem is hairiest at the nodes, and is hairless or minutely hairy between the branched hairs. It climbs by turning clockwise at the tip (twining). Charles Darwin observed that it made a complete revolution every 128 minutes during daytime in hot weather. 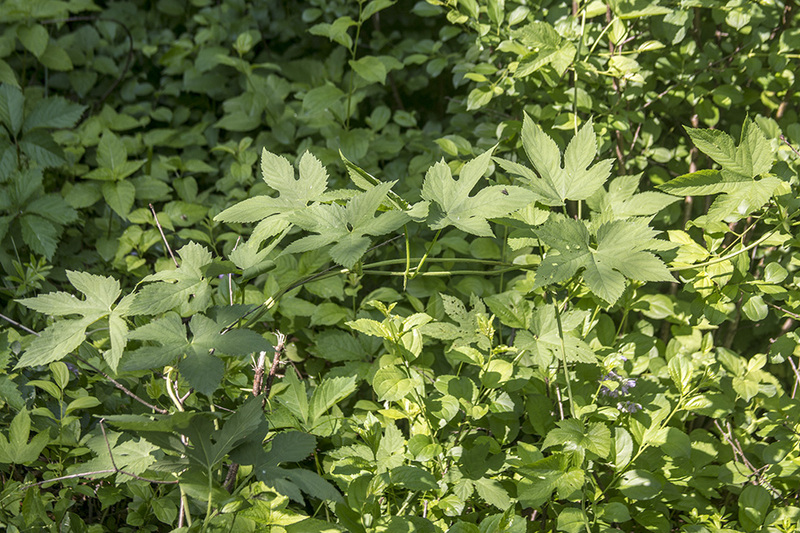 Leaves are opposite, broadly egg-shaped in outline, and heart-shaped at the base. They are on 1¾″ to 8″ long leaf stalks (petioles). The petioles are as long or longer than the leaf blades. They are sometimes twining and are sparsely to moderately covered with stiff, 2-branched hairs. At the base of each leaf is a pair of lance-shaped, leaf-like appendages (stipules). The stipules are sometimes fused, appearing as a single stipule. Leaf blades are 1¼″ to 6″ long, and 1½″ to 7″ wide. They are palmately divided into usually 5 lobes, sometimes 7 or 9 lobes. The lobes are broadly to narrowly egg-shaped, taper to a sharp point at the tip, and are somewhat narrowed at the base. 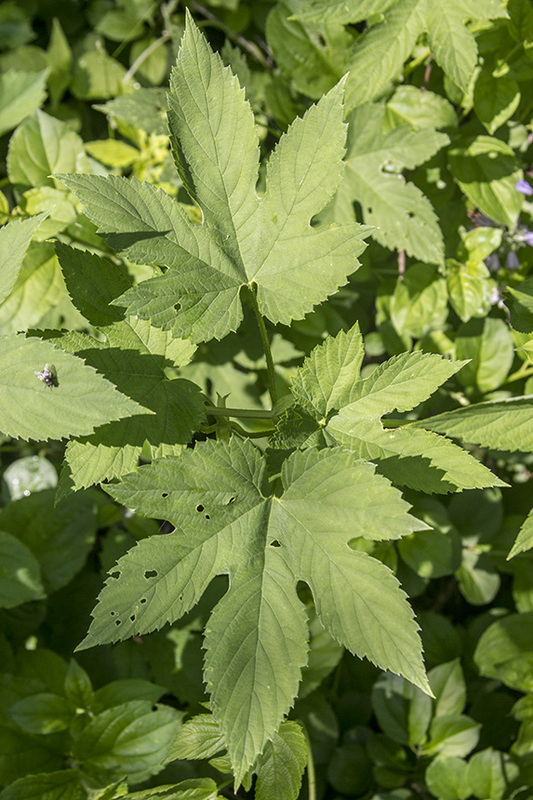 The upper surface of the leaf blade is rough to the touch and is sparsely covered with stiff, prickly hairs. The lower surface is rough to the touch. It is sparsely to moderately covered with stiff, spreading, bulbous-based hairs along the veins, and is hairless but has yellow glands between the veins. The margins have sharp, forward pointing teeth and stiff, prickly, bulbous-based hairs. Male and female flowers are borne on separate plants. The male inflorescence is loose, erect, branched cluster (panicle) of 20 to 100 or more flowers at the end of the stem and rising from leaf axils. The panicles are 6″ to 10″ long, and ¾″ to 1½″ wide. The female inflorescence is a pair of dense, cone-shaped, ⅜″ to ¾″ long spikes (aments) drooping from leaf axils. 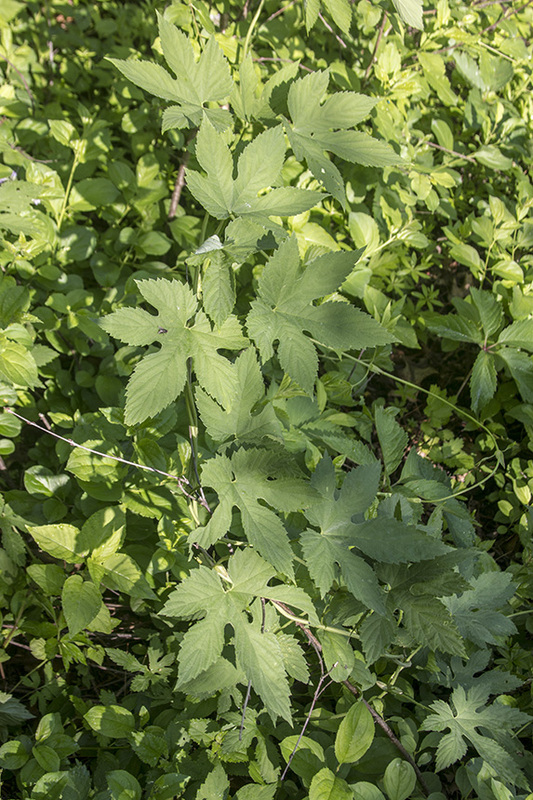 The ament consists of overlapping, dull, pale green bracts. Male flowers are star shaped, 1 ⁄32″ to ⅛″ long, and about ¼″ wide. There are 5 reddish sepals, no petals, and 5 stamens. The anthers are not glandular. Female flowers consist of an ovary with a long, slender stigma. They are paired between overlapping bracts of the ament. The ament elongates when in fruit, becoming ⅝″ to 13 ⁄16″ long. The bracts are ¼″ to ½″ long, egg-shaped to broadly egg-shaped, densely hairy along the margins, and sparsely to moderately hairy on the outer surface. They are not glandular. The fruit is a light brown to yellowish-brown, broadly egg-shaped to nearly spherical, ⅛″ to 3 ⁄16″ long, 1 ⁄16″ to ⅛″ wide seed capsule (achene) enclosed in a persistent, enlarged calyx and covered by a papery bract. It is not glandular. 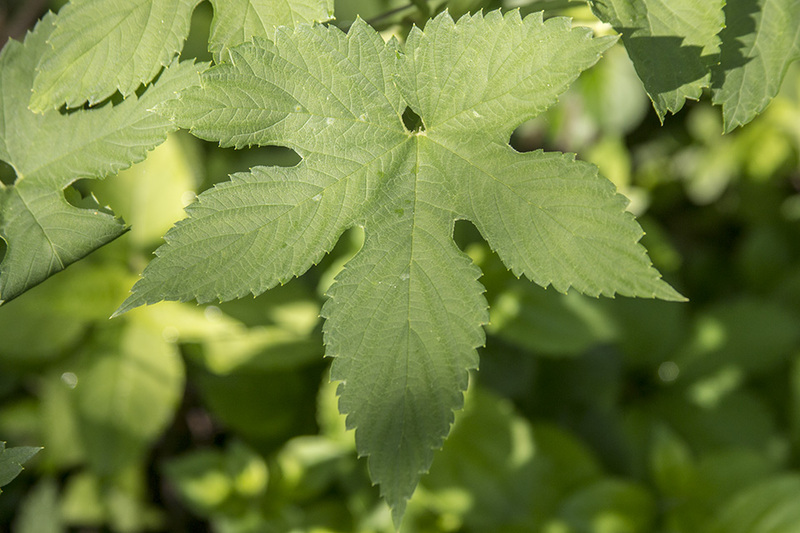 Common hop (Humulus lupulus) leaf blades have usually 3, occasionally 5 lobes, and sometimes no lobes on leaves near the end of the vine. The underside is hairless or softly hairy, soft to the touch. The petioles are shorter than the leaf blade. The bracts on the ament do not have hairs on the margins. The outer surface of the bracts, the anthers, and the achenes have stalked glands. The fruit structure is fragrant when crushed due to these glands. A cylinder-shaped, spike-like inflorescence bearing unisexual flowers that have no petals. 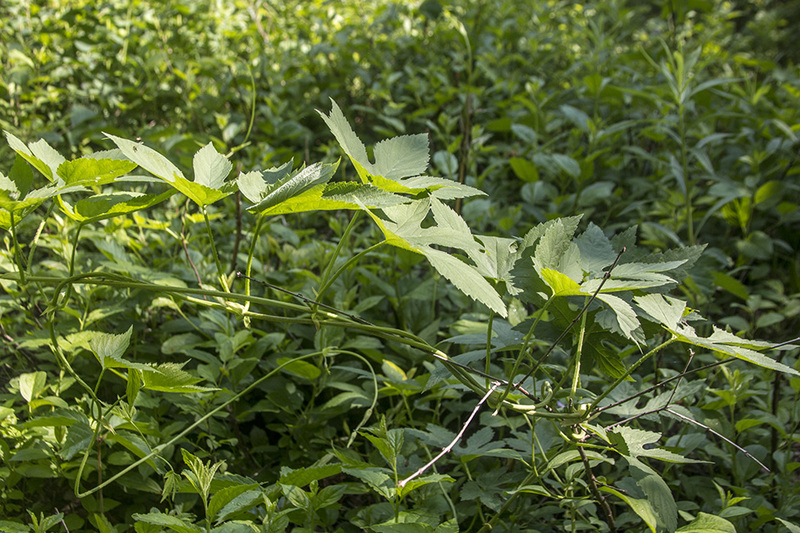 This video is about the affect Japanese Hop (an invasive species) has on riparean forest's.